If you will be given a chance to meet one Disney character in person, who would it be? For those little girls, it would definitely be one of the princesses. Will it be Snow White, Cinderella, Belle, or Jasmine? For the boys, it would surely be Buzz or Stitch. Growing up during the time when Disney made many animated films will immediately turn you into a fan of any of their characters. Aladdin and Jasmine enthralled me until now so when I had the chance to visit Disneyland in Hong Kong, I looked for these characters. 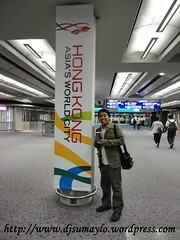 Hong Kong was not a planned trip. Luckily, Cebu Pacific had a promo fare that time. My friend and I immediately took the opportunity and bought our tickets. That time, the only available slot was the last flight going to Hong Kong from Cebu City. That was around 11:00 in the evening. We got our tickets going to Hong Kong. Two weeks later, we got our tickets to and from Cebu City, still in promo fare. This trip was definitely meant for those who have less money, who boldly took the risk (and adventure) of going to another country with a few hundred dollars. We purchased the tickets last year. While waiting, my friend planned everything. He was the one who went there already. Unfortunately, due to his strict rules, we never had the chance to talk a few days before our scheduled flight. I never had any coaching on what will happen during the whole course of the trip and that includes answering questions at the immigration. We made it through immigration in Cebu City and I barely made it in Hong Kong because I do not have much information about our trip. Good thing I got in. Disneyland was part of our itinerary but we did not go there on our first day. My friend had to do some courtesy visits to their branch in Hong Kong, which, if you get the total number of hours spent there, it would be a whole day taken from our trip. Aside from that, we often heard unsolicited advises from people (acquaintance or just someone waiting for the bus because my friend liked to socialize with strangers) who discourages us to go to Disneyland because it is a place for kids and we will never enjoy it. But why take heed to these unsolicited advises? It was our trip in the first place. 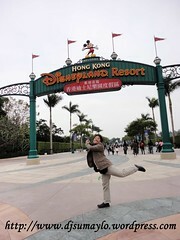 On that day, we went to Ngong Ping first before going to Disneyland. We spent a few hours in Ngong Ping enjoying the scenery and the HK$20 ice cream. 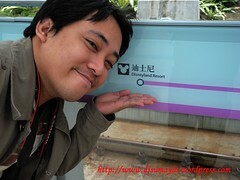 From Ngong Ping, we immediately took the MTR going to Disneyland train station. It was around 2:00 in the afternoon. The air was chilly because it was the end of winter in Hong Kong but still, we forced ourselves to get to Disneyland as fast as we can before the parade starts at 3:00. There was only one train ferrying tourists to the resort. I was happy that we were the first to arrive at the train station because at least we could easily board the train once it arrives. Slowly, tourists who took public transport (MTR) arrived at the waiting area. Kids were running around very excited to see any of the Disney characters. 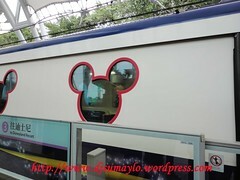 The train arrived with Mickey Mouse head for windows. Once inside, you would immediately see well-cushioned couches instead of the usual seats in our usual trains. 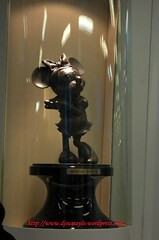 You can also see various miniature statues of Disney characters from the classic Goofy to Tinkerbell. The train was spectacular. When we stepped out of the train, it felt like I just arrived at Hogwarts. The station reminded me of Platform 9 ¾. We surrendered our train tickets and as we entered the resort, we were serenaded with “A Whole New World” which, I think, was the right music to greet the tourists. The train station was a bit far from the entrance of the resort. We immediately posed for photos and took maps around the park. Our first stop was the souvenir shop. We did not buy anything of course. We were there waiting for the parade to start. Stupendous was the right word to describe everything I saw at the parade. In fact, it was not just a parade. It was a show in itself; dancers and acrobats doing their thing. Amidst the chilly air, I saw Tinkerbell happily waving and smiling to the kids and kids at heart (like moi) who were watching the parade. The Disney Princesses, Buzz Lightyear, Pooh, Lilo and Stitch, and some of the other characters I do not recognize. The kids joined the dancing and singing. Props were also distributed. Everyone was happy. But the parade ended without Aladdin and the Genie. 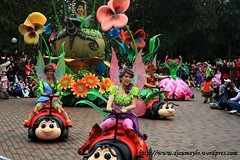 We toured around the park hoping that I could meet other characters. At the Tomorrowland, we got in line for some of the rides. We tried the indoor roller coaster. We had a nasty and funny conversation with Stitch on-screen. He called my friend his co-inmate at the intergalactic prison cell. He mistakenly destroyed a planet in front of us. Everything was fun! The Adventureland was the total opposite. We saw Tarzan’s house. We took a boat ride and experienced getting wet while some mechanical elephants sprayed water. Gigantic crocodiles tried to attack our boat as well. We angered a god who made the water burn into flames. As it turns out, all our pictures were blurry. We went to the realm of the Princesses. It was more or less the same rides. Instead of an aircraft, you get to ride Dumbo’s back. We never tried any of the rides in that realm. We never dared to ride the swirling teacups in Alice’s wonderland. But we went into the Small World. We did not know what to expect. We took the boat ride inside and saw hundreds of dolls while listening to the song “It’s a Small World” translated into different languages. It was a relaxing ride after all that we have been through. Waiting for the fireworks to start was both exciting and tormenting. It was exciting because it was rumored to be so wonderful. It was tormenting because we have to sit on the paved road for at least 30 minutes while the temperature was getting lower as the night grows older. The waiting made me realize that most of the people who are sitting in front, beside us, and at the back were all Filipinos. They were with their kids on that chilly night as well. The announcement aired said “the fireworks will start in 5 minutes.” I prepared camera and myself. 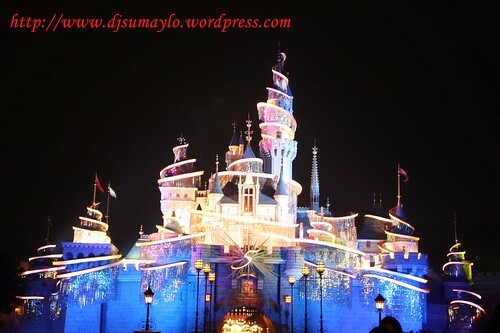 Then, a cut-to-cut scenes from Disney’s well loved animated films were shown on both sides of the castle wall. The lights played in tune with the music. Then the fireworks started. At first, I was able to capture several photos. Later, I realized I stopped shooting. And when they played the song “A Whole New World” with all the dancing lights and fireworks, I put down my camera, stared at the castle completely hypnotized by what was happening and front of me, and I suddenly started crying. For someone who never had this kind of childhood, who never had much toys, who just look at other kids play, for someone who longed for this kind of feeling, Disneyland was not a waste of time. I never considered it as a place exclusive for kids. I will never say that adults will never enjoy Disneyland. I was right all along when I tell my students and friends not to forget their childhood. There is a kid in all of us. Do not shun away that kid in us. That kid in us is the only thing that will keep us sane. It is the only thing that will help us appreciate little things and understand trivial ones. I hate to admit it, but I also was teary eyed while watching the fireworks. The music was so nostalgic and the spectacle was all too a splendid sight that one can’t help being amazed.